Rocking up on the 12 megapixel bandwagon is Panasonic, who have just announced their new Panasonic Lumix DMC-FX100 digicam, a sweet-looking snapper sporting a 1/1.72-inch sensor, 28mm wide-angle zoom and image stabilisation. Shimmying its way to the vanguard of the Lumix FX compact camera series, the Lumix FX100 packs Panasonic’s Venus Engine III processor supporting a High-Speed Burst shooting mode that can knock out a sizzling eight shots per second, with a High Sensitivity mode taking the sensitivity into the stratospheric heights of 6400 ISO. 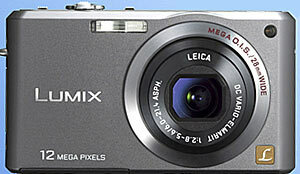 Once again, Panasonic has used Leica DC-branded lens, fitting the FX100 with a 3.6x optical zoom (equivalent to 28-100mm on a 35mm film camera) with a bright f/2.8 maximum aperture. There’s a handy Easy Zoom feature that instantly sets the zoom to maximum, with an option to activate the Extra Optical Zoom with a second touch of the button, giving you a 7x zoom at a much reduced 3MP resolution. The attractive metal bodied compact comes with Mega O.I.S. (Optical Image Stabiliser) and Intelligent ISO Control which detects movement and adjusts the ISO setting and shutter speed accordingly. The maximum ISO of 6400 puts the FX100 into bat-like territory, although it has to be said that Lumix cameras haven’t got the best of reputations for controlling noise at high ISOs, but Panasonic are saying that the Venus Engine’s ability to separate luminance noise from chromatic noise should improve things. 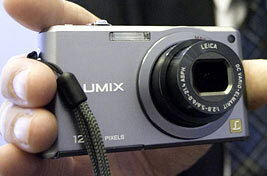 As with previous Lumix models, the FX100 offers a Wide Screen (16:9) mode for viewing pictures and movies on yer fancy home wide-screen TV, with the camera capable of recording movies up to WVGA (848 x 480) at 30fps and 1280 x 720 at 15fps, direct to SDHC/SD cards. It looks to be a snappy snapper too, with Panasonic claiming a shutter release lag of just 0.009 seconds, and a burst mode offering two shots per second at full 12.2-megapixel resolution. 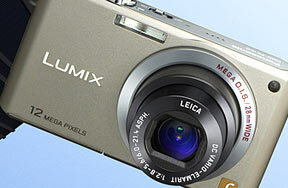 A High-Speed Burst shooting mode fires off a sizzling eight shots per second until the SDHC/SD memory card is full. Naturally, the Panasonic FX100 comes stuffed to the gills with auto settings for every conceivable occasion, offering no less than 20 scene modes plus the new High Sensitivity and High-Speed Burst shooting modes. The camera also offers Category Playback, letting punters organise their shots into categories such as portraits, landscapes, nightscapes, events, and motion pictures for viewing. Pricing and availability is still to be announced. 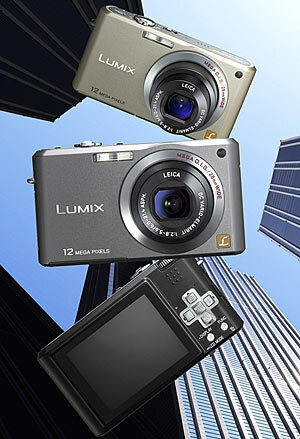 Panasonic tell us it should be available in July.